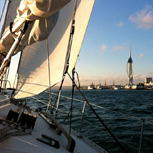 The RYA Day Skipper course teaches pilotage, navigation, seamanship and boat handling up to the required standard to skipper a small cruising yacht safely by day in tidal waters with which the student is familiar. 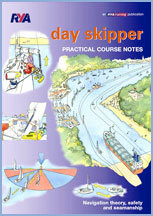 Our RYA Practical Day Skipper Course covers Tidal or Non-Tidal waters. 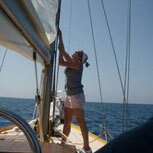 Suggested Minimum Pre-Course Experience: 5 days sea time, 100 miles, 4 night hours. 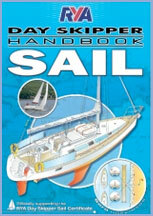 Assumed knowledge: Navigation to Day Skipper Shorebased and basic sailing ability. 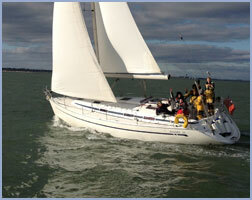 Ability after the Course: Able to skipper a small yacht in familiar waters by day. Preparation for sea – Is able to prepare a yacht for sea, including engine checks, selection of sails, securing and stowage of all gear on deck and below. 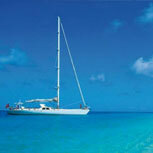 Deck Work – Can reef, shake out reefs and change sails to suit prevailing conditions. Can prepare an anchor, mooring warps and take charge on deck when mooring alongside, coming to a buoy, anchoring, weighing anchor and slipping from a buoy or alongside berth. Navigation – Is proficient in chartwork and routine navigational duties on passage including: Taking and plotting visual fixes. 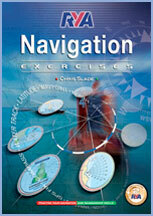 Use of electronic navigation equipment for position fixing. Use of waypoints. Working up to DR and EP. Estimating tidal heights and tidal streams. Working out course to steer to allow for tidal stream, leeway & drift. Knowledge of IALA buoyage. 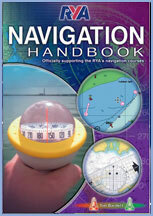 Maintenance of navigational records. Use of echo sounder and lead line. Pilotage – Can prepare and execute a pilotage plan for entry into, or departure from, harbour. Understands the use of leading and clearing lines. Use of transits and surroundings as aids to pilotage. Meteorology – Knows sources of forecast information. Can interpret shipping forecasts and use a barometer as a forecasting aid. 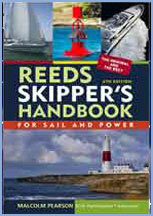 Rule of the road – Has a working knowledge of the International Regulations for Preventing Collisions at Sea. Maintenance and repair work – Understands and is able to carry out maintenance tasks. Knows the properties and uses of common synthetic fibre ropes. Emergency situations – Is able to take correct action as skipper for recovery of man overboard. 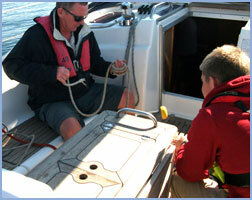 Understands distress flares and how to use a liferaft. Can operate a radiotelephone in an emergency and send a distress message. Understands how to secure a tow. Understands rescue procedures including helicopter rescue. Yacht handling under power and sail – Can bring a boat safely to and from an alongside berth, mooring buoy and anchor under various conditions of wind and tide. 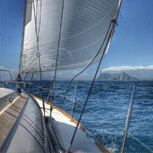 Can steer and trim sails effectively on all points of sailing. 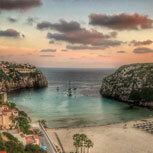 Night cruising – Has experienced sail cruising at night, including leaving and entering harbour. Understands the special consideration for pilotage plans, keeping a lookout and identifying marks by night. Just wanted to say thank you for a most enjoyable week and your expert tuition delivered in such a calm manner which will, I’m sure, give us both the confidence to push the boat out further as it were.